Winter is not the Midwest’s finest season. It’s bleak, and sloppy, and often bitterly cold. It’s the primary reason so many “snowbirds” head south to Florida for the winter. But if winter in the Midwest has one redeeming quality, it’s this: it tends to bring out the best in people. The snow and polar temperatures seem to be linked to neighborly qualities that aren’t quite so evident during the rest of the year. In the spring and summer neighbors might pass by with just a wave, but during the winter you’ll probably get into a friendly conversation with the people down the street as you’re cleaning the snow off your car and scraping the ice off the windows, and as likely as not you’ll go down and lend them a hand as they are working on their cars, too. 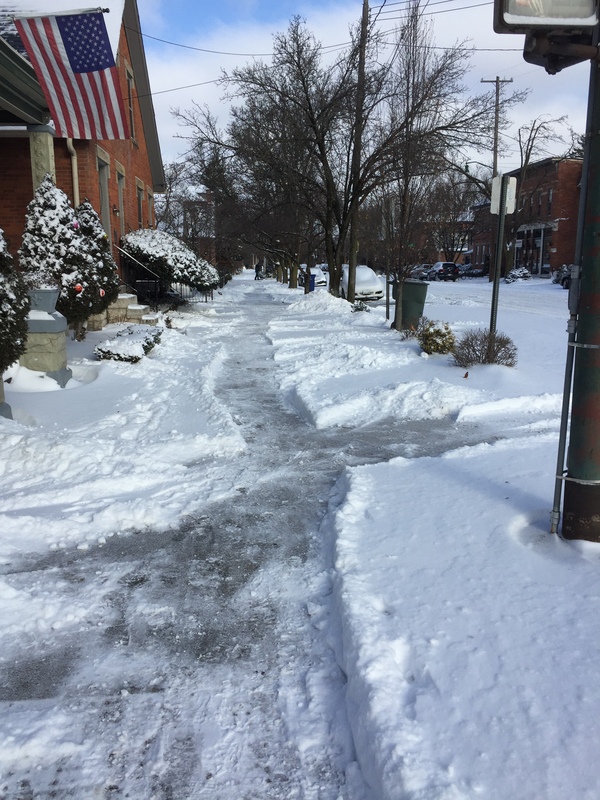 You’ll see people helping complete strangers rock their cars out of the snowdrifts on icy mornings, or shoveling their elderly neighbor’s sidewalk, just because it’s the right thing to do. I took the photo that appears with this post yesterday, on the morning after a storm that dumped about six inches of snow and ice on Columbus. That trail of cleared-off sidewalk was accomplished by the single, bundled up guy with a snowblower you can just see in the distance; he’d worked diligently to create a walkway for his entire block. I suppose it’s possible he was being paid for the job, but somehow I doubt it — it was too early in the morning, and the idea that all of the neighbors got together to hire someone so quickly seems unlikely. The much more plausible explanation, and the one that’s consistent with my experience, is that he got out with his snowblower, took care of his own property, and just thought that as long as he was out there in the cold he might as well do something nice for his neighbors. The Winter Samaritans of the Midwest help to make a brutal season a bit more tolerable. This entry was posted in Columbus, Ohio, weather and tagged Columbus, midwest, Neighbors, Ohio, weather, Winter Samaritans by webnerbob. Bookmark the permalink.